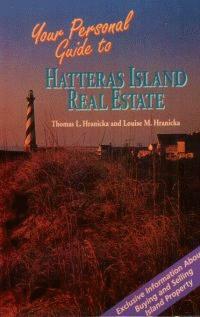 Tom and Louise Hranicka, brokers with Outer Beaches Realty, have published a book titled, Your Personal Guide To Hatteras Island Real Estate. This fact-filled handbook provides the first comprehensive guide to the island's real estate market. Divided into six parts, the book covers a broad range of topics from the basic knowledge needed to get started in the market to financing and closing your purchase, as well as a discussion of the issues surrounding water, wells and wetlands. An overview of the island's seven villages, including selected subdivisions, contains the prices of various types of properties highlighted by background and history on each of the locations. Written in a comfortable easy-to-read style, the book is the perfect choice for relaxing on the beach or as an essential resource for those thinking about buying or selling island property. "Don't let the title fool you. Your Personal Guide To Hatteras Island Real Estate offers good information about buying and selling property anywhere on the Outer Banks. Tom and Louise Hranicka, two local real estate brokers, tell just about everything you need to know in 87 well-written pages." Chris Kidder, Real Estate Columnist, The Virginian-Pilot. Your Personal Guide to Hatteras Island Real Estate is temporarily out of stock. An expanded second edition is planned for later this year. Copyright Tom & Louise Hranicka.